These are practical and doable and will actually make a huge difference in how rooms look! 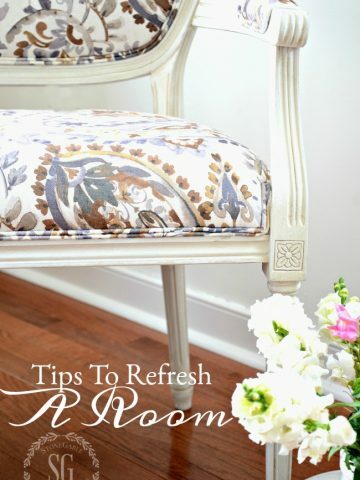 I use these tips often and they really work to make a big improvement in my decor! Let’s get started loving our homes by incorporating these 5 easy changes! Paint changes everything. Plain and simple. One of the best ways to change the look of a room is to paint something in it. The walls, floors, furniture, accent pieces. Tables, chairs, cushions, lampshades, doors, books… you name it and you can paint it! A paintbrush is like a magic wand. USE it! This is the best way to make a room look drastically different! Paint is easy to use and the cost is minimal compared to the impact it makes! If one of your rooms needs something to freshen it up… paint it! I think painting is good for the soul and our homes! Get out the paint and touch up a couple of rooms. We did this over the weekend and I was so surprised how fresh the whole room looked! Sometimes we get decor blind! When we look at the same things in a room for a long time we become oblivious to the need to freshen things up! Have you ever noticed how our rooms seem to collect “things”! They collect too many pillows or books or accent pieces or chairs or chotchkies! Try purging your room of any auxiliary decor noise! Also, try removing one piece of furniture. Many of us don’t give our rooms enough breathing space! If you remove a piece of furniture try a new configuration for the furniture left. It may just be what your room needed! Big or small, editing things and playing with your decor will give you a fresh more curated look! This is such a simple way to change the look of a room. Put everything in its place and take out ANYTHING that does not belong there. I’d actually start with this tip when I want to make a difference in a room! I organized magazines and a few books I read in the living room in baskets under the coffee table on the lower shelf. I often have a bad habit of tossing them on the floor by the sofa. Wow, did that one little thing make a big difference! I am a huge believer in repurposing furnishings. Give furniture or accessories a second life. Think about bringing decor from one part of your home and putting it in a different room. Take all those gorgeous platters you own and hang them on the wall. Use an old colander as a planter. Make a vintage milk can in the basement into a great lamp (I’m actually doing this!). Use a bedroom dresser as a cool bar or hang wire baskets in the kitchen to hold your cookbooks. I forgot all about the saturated gold lumbar pillow that is now on my sofa. I found it rummaging around in the basement and thought a little bit of color might be nice in the living room for a change. Just something this small makes a big difference. 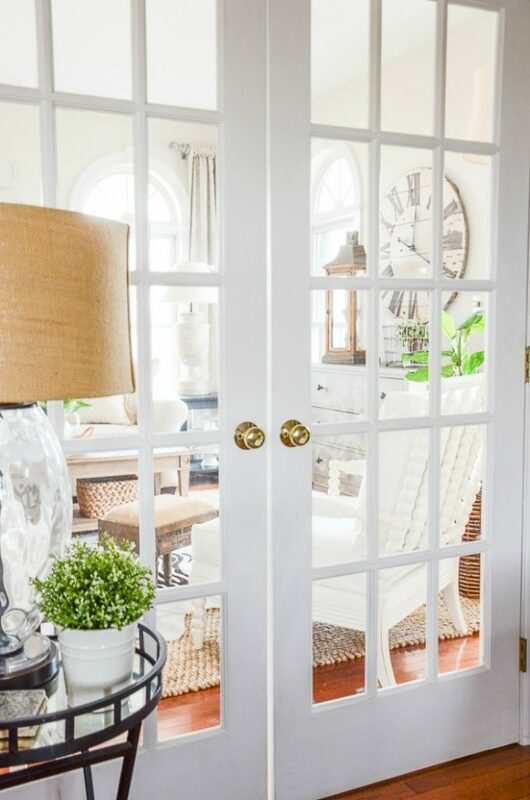 Thinking outside the decor box will get your creative juices flowing and you too! Layering decor is a skill every home decorator should acquire. 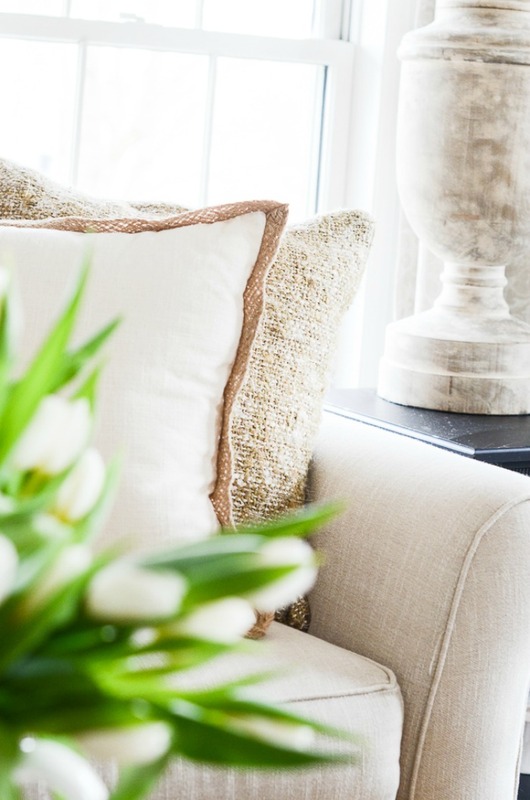 Layering is a great way to add interest and to breathe new life into a tired room. Just give it a try! Stack books and top it off with a potted plant in a cool container. 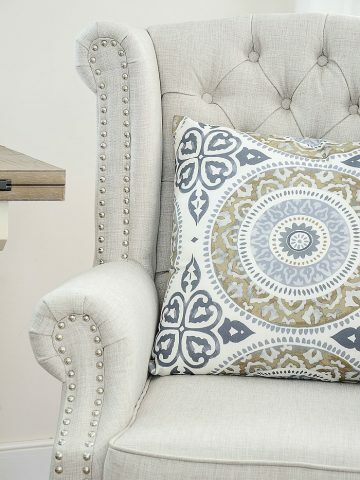 Add an extra throw to a chair and add a pillow. Easy idea with lots of panache for a tired room! I’ve been layering rugs lately. 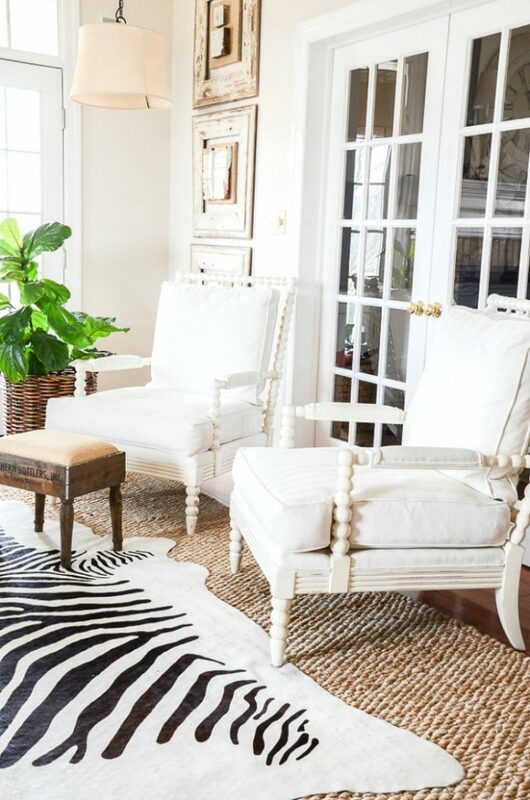 I added a sisal rug to the living room and put the zebra rug on top of it. I’m also doing the same thing to another room. What room in your home needs a little love? Could you use one of these tips to make a huge decor difference! Make a plan and begin changing your home today! After 67 years in Central Ohio, we’re moving to Arizona! I want to decorate my home appropriately but not have it look cliche. We have a gorgeous view of the Santa Rita Mountains. My taste leans more to a soft contemporary leaning more towards traditional. Your thoughts? If I had that view, I’d keep my furnishings neutral and on the minimal side! Let your spectacular view fill your home. This is such a smart question, Cathy. It’s wise to realize that your view is unique and will have an effect on how you decorate. Congratulations on your new home. May God bless you! Welcome Conniesue. You will be beyond blessed. Thanks for all the great reminders, Yvonne. The light bulb went off when you suggested painting something. I have a good quality, burlap colored lampshade, that goes back into storage after Fall. Dare I paint it a light color to keep it on the old brass lamp base throughout the year? I love to read your blogs daily and it’s amazing to implement your testing ideas in improvising our house. Yvonne, I just came across your Wonderful website and wanted to tell you what a Blessing it is! I have been looking for a website that would help feed my spirit and soul yours is just that!. Your Beautiful Designs of Scriptures are perfect for our home. I will be printing and framing them to help encourage us on a daily basis. Your work is truly inspired by our Father! I don’t subscribe to many websites, I have a web based business I just started in January, and am very busy getting it out to the masses. Yours caught my heart! P.S. I tried to leave this comment on your “Contact” area at the bottom of your page but there is an error in the “Captcha” section. God bless you in your endevors, Conniesue! And welcome to the StoneGable family! We just purchased a new box springs and mattress for our master bedroom. We like the room, having redecorated just 3 years ago, but I still wanted to refresh it. We purchased new lamps – one is a really cool reading light with variable brightness levels. I decided we needed a refresh of one of the nightstands so I ordered a small brushed gold table with a tempered glass top. It looks fresh and modern, but still works with our more traditional furniture. It looks cool with the reading light and a new alarm clock. My color is primarily ivory, but we have a large lumber size Pottery Barn pillow with embroidered sunflowers to add a punch of color. Our artwork is simple, one large print of a photo my husband took in Kinsale, Ireland. I had it printed out on a paint canvas so it looks like a painting. The colors are primarily ivory and brown, but some of the houses are painted gold so it picked up the color of the pillow. 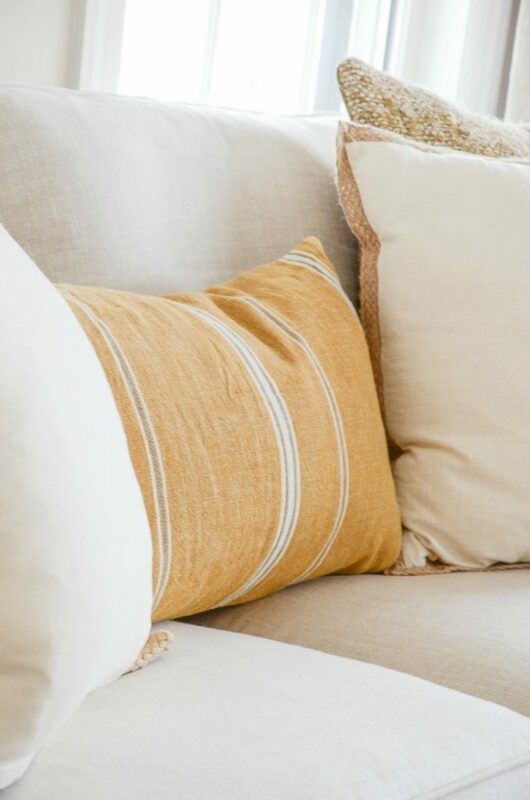 Amazing how your gold lumbar pillow made your sofa look like sunshine! I’m always surprised by how a well-placed pop of color can change the look of a room. 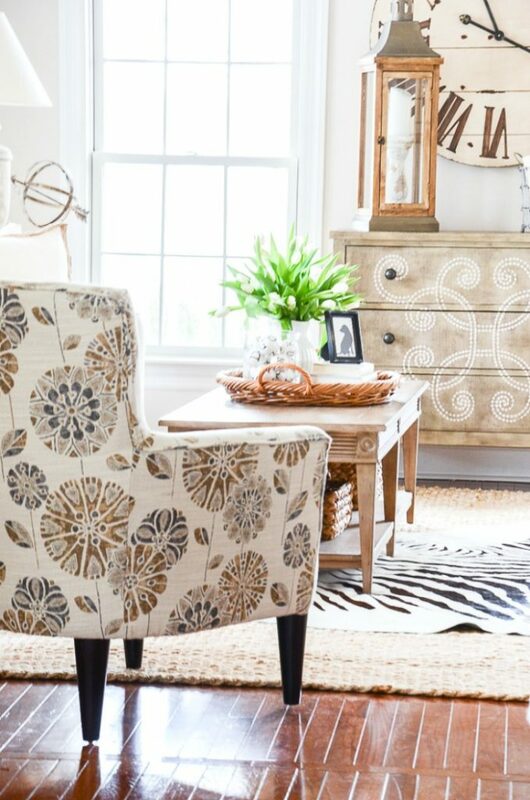 The charming vignette you created with your wicker tray is fresh and happy I love a touch of whimsy in any room; it keeps us all on the lighter side of life. Thank you for sharing creativity, Happy Valentine’s day! 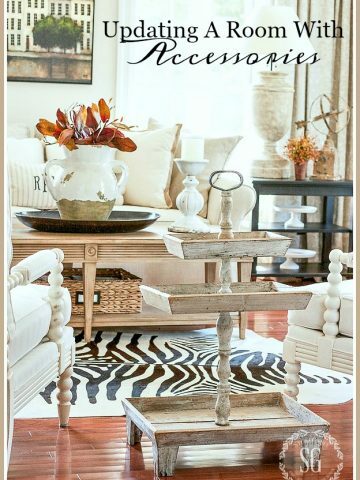 I need to change up my mantel, console & coffee table styling. I tried after a Christmas but nothing looked right. I put everything back the way it had been and all was right. I think I’m just so used to seeing it one way, that my eye is not adjusting to new. This has me so motivated to work inside but it is warm enough here to spray for weeds so outside I go. Great ideas as always! 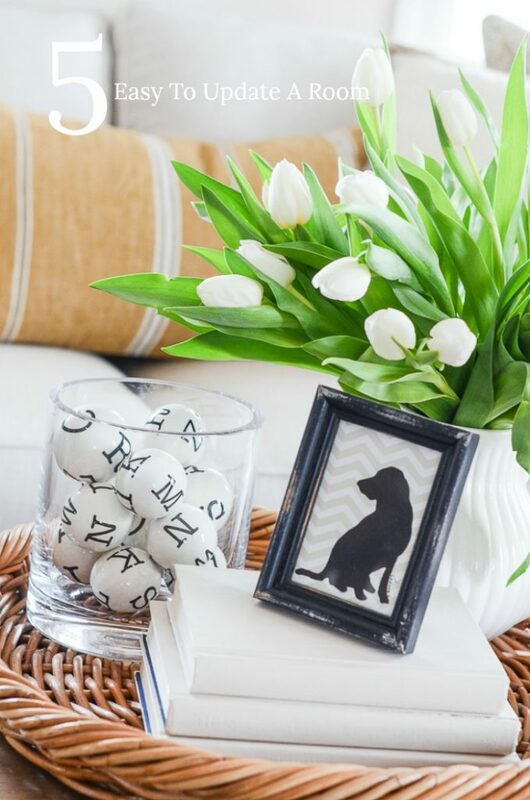 Is there a resource for the adorable ‘letter balls’ contained in the glass holder? They are so smart looking. Hi Shelly, they came from the Pottery Barn, but I don’t see them on their site anymore. Your suggestions give inspiration to my restless decorator spirit! I was ready to empty a lot of rooms in our house and only put back only what that makes me happy.Your ideas are much more practical. Thanks Shelley. Sometimes something small makes a big difference! 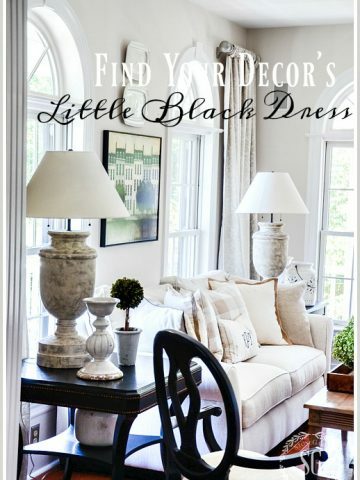 I agree that a little paint can change a room or give new life to old pieces.I’m in the process of changing to neutrals with a lot of black, white and cream, always classic. I often see the cute dog silhouette in your posts. Is there a resource you might share? Thanks again for all your wonderful tips to transform our home into a fabulous space like yours. You rock! I finally talked my husband into painting our brick fireplace white. He did a terrific job and the results are stunning! You’re so right about what a big difference a little paint can make. As always, Yvonne, I appreciate all that you do to instruct and inspire. Pillows has always been my go to easy update. I have a big ottoman in my florida/family room that I’ve covered for different seasons, it’s currently uncovered but it needs one? I have so many lanterns, that I need creative ways to use them? Thanks yvonne, I love your blog. This is just what I needed to read this morning. My living room needs a little refreshing. Did you end up painting any of your walls sonnet af 55 I’ve settled on that color and would love to see what it looks like. I love your blog! It is full of inspiration. Where can I purchase the large stars by the fireplace? Hi Maryann! I’m so thrilled you are enjoying StoneGable! The large stars came from a vendor at a Spring Fair a couple years ago. Sorry, I can’t tell you more! Great tips! I do think sometimes editing can play a huge part in changing a room. I always say, when in doubt…subtract! HI Eileen, They came from my local Pottery Barn Outlet. Hope this helps. This is a terrific post — thank you for creating it. 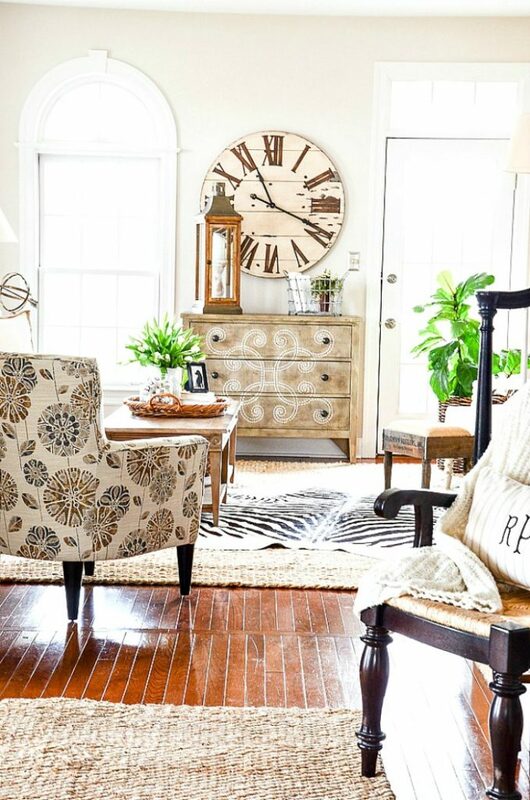 One quick question on the natural fiber rug in your sitting room — where did you pick it up? Thank you, as always! Hi Susan, I found the natural jute rug on Amazon. They have great buys on natural rugs. Hope this helps. Thanks for all the great tips in todays blog,I look forward to your post everyday. Have a good weekend ,Yvonne. Thank you for all your inspirational ideas Yvonne. I look forward to reading your blog every day. Thank you and God bless you. Unfortunately I don’t have a creative bone in my body and funds are extremely limited but I am trying to follow the advice you give us. do you by chance offer any service to review pictures of rooms and offer advice? My lounge is in dire need of an update but I just cannot seem to get it right. It would be wonderful if you could offer some advice. Thank you so much for all the pleasure I get after a hard day at work. Sandy, email me and we will talk! Clever and beautiful Yvonne! Love the look of your living room like that 🙂 It gives me a lot of ideasfor our own house! This was a great and timely post. I have a clock with a dark frame that is wearing a bit thin on me. I’m heading over to your linked post to see just how you did yours. Thanks, Yvonne! Great tips, love the clean look of your organized shelves!